Here's a clever cell phone tote, or use it to carry other small items to the beach or on a picnic. It's made of sturdy canvas, roughly 5-1/2" wide by 4-3/4" tall. The cell phone tote has a pair of heavy webbed handles, all securely double-stitched and overlocked together. 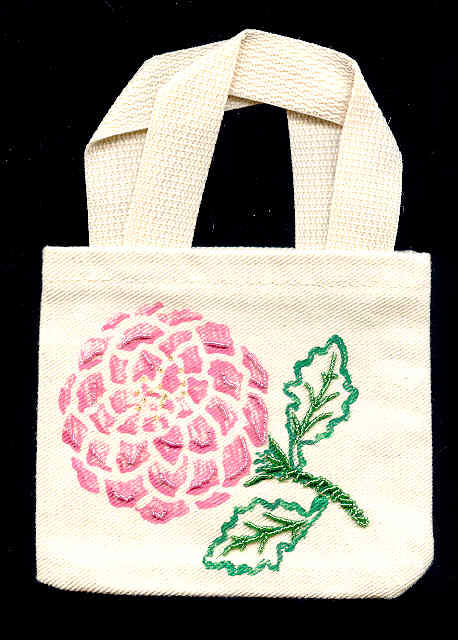 I've added a heat-set fabric painted image of a hot pink chrysanthemum with emerald green leaves and stem, which I've embellished with tiny seed beads. Follow the care instructions clearly listed on the tag inside the bag (machine wash, cold water, tumble dry low temp, don't iron directly on the design) and your little cell phone tote bag will last you a lifetime. We strive to provide you with only the finest here at SPARKLE PLENTY.